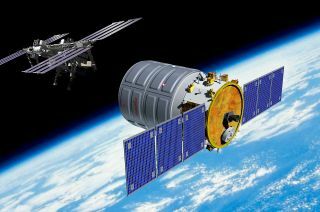 Artist's rendition of Orbital Sciences' Cygnus cargo spacecraft in orbit, on its way to the International Space Station (ISS). When a first-of-its-kind commercial cargo spacecraft launches toward the International Space Station later this month, it will fly under the name of the astronaut who helped make the historic mission possible. Orbital Sciences Corp. revealed Wednesday (Sept. 4) that it had christened its first Cygnus resupply ship after G. David Low, a space shuttle astronaut who was overseeing the Dulles, Va. company's development of its commercial resupply launch system when he died of cancer in 2008. Scheduled for a Sept. 17 launch atop an Orbital Antares rocket from the Mid-Atlantic Regional Spaceport's Pad 0A at NASA's Wallops Flight Facility in Virginia, the resupply ship G. David Low will demonstrate for the space agency that Orbital's Cygnus freighters can safely deliver supplies to the space station. The barrel-shaped unmanned spacecraft will carry about 1,540 pounds (700 kilograms) of cargo on this first flight, comprised mostly of food for the orbiting laboratory's crew. After this demonstration proves Cygnus' capabilities, later missions will deliver science experiments and their related hardware, spare parts and other more critical supplies. Orbital developed Cygnus and Antares as part of NASA's Commercial Orbital Transportation Services (COTS) effort. After a successful completion of this mission, Orbital will begin conducting eight planned cargo flights to the space station under a $1.9 billion Commercial Resupply Services (CRS) contract with the space agency. "Our name for this [spacecraft, G. David Low] is going to reflect a real pioneer in the space program, particularly at Orbital, who was instrumental in winning the COTS demo mission and also winning the CRS [contract]," Culbertson said. NASA portrait of space shuttle astronaut G. David Low. Low, who was the son of an Apollo program manager and deputy administrator of NASA, flew three space shuttle missions between 1990 and 1993. He joined Orbital Sciences three years later as the company's vice president for safety and mission assurance. He became senior vice president and COTS program manager in 2006. Orbital is one of two companies flying missions under the COTS and CRS programs for NASA. The agency awarded similar partial-funding contracts to Hawthorne, Calif.-based SpaceX, which since 2006 has flown two demo flights and two resupply missions using its Falcon 9 rocket and Dragon capsule. Orbital's G. David Low flight to the space station is slated to be the final mission under the COTS program. "This flight with Orbital is their second flight — they had a very successful demonstration with the Antares vehicle as part of our COTS demonstration program last April," said NASA's COTS program manager Alan Lindenmoyer. "This time they are going to be demonstrating a full mission with a brand-new, state-of-the-art, cargo-carrying, autonomous spacecraft, Cygnus." "So this represents the culmination of the COTS program after many years," Lindenmoyer added. A Sept. 17 launch of Orbital's G. David Low Cygnus sets up a Sept. 22 arrival at the International Space Station, where Expedition 37 crewmembers will use the outpost's Canadarm2 robot arm to capture and berth the cargo craft. The rendezvous will follow a series of test maneuvers by the spacecraft to demonstrate its ability to navigate to and around the space station. The crew will then have a month to unpack the spacecraft and repack it with trash before they detach and release it from the orbiting laboratory to be destroyed during its re-entry into Earth's atmosphere. "Orbital has been involved in human spaceflight for a long time, but this is the first time we've ever actually launched a dedicated spacecraft carrying cargo for consumption in space," Culbertson told collectSPACE.com. "So this is a big deal for us."